Show us something you love. It could be your favorite novel, the light of the moon on your deck at night, the beach on a hot day, or that special you-know-who. Get creative! If you live in the Southern hemisphere, the warmth of summer is part distant memory, part dream for the future. In the Northern hemisphere, the polar vortex that made winter nearly unbearable is almost* forgotten as the sunshine finally warms our days. 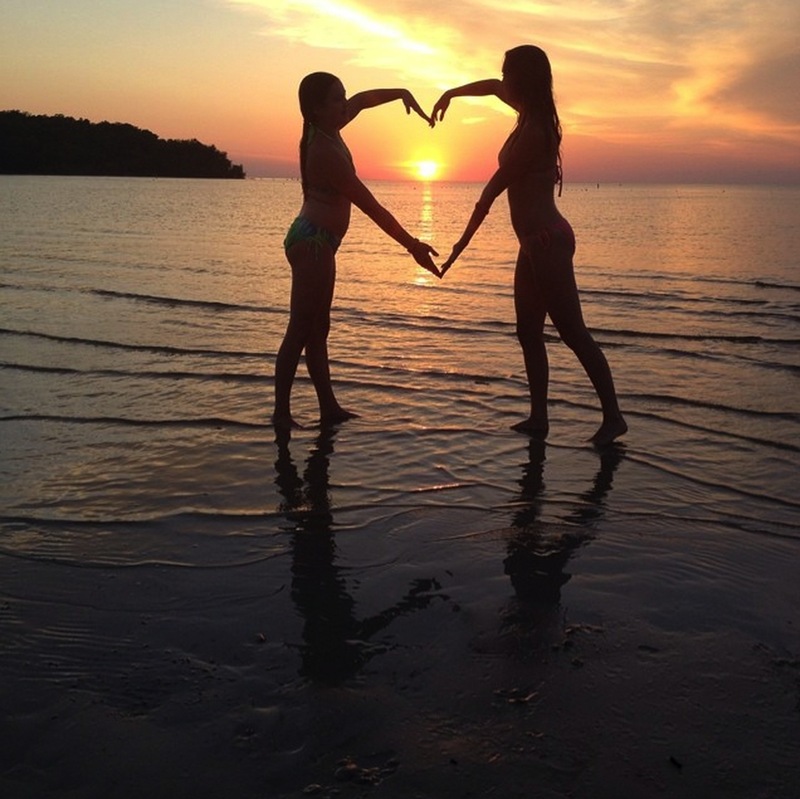 Here, my two nieces show their love for the sunset at Grand Beach, Manitoba, Canada. Summer Lovin’ Photo by Barb Garrioch. This week, share a photo that says summer lovin’ to you. It might be a favorite pair of sandals you can’t bear to part with, the homemade salsa you made with veggies from your garden, the flowers you planted, or your family frolicking on the beach. If summer is on the way in your hemisphere, show us something hot hot hot: your homemade sriracha sauce, some friends shuckin’ and jivin’ on the dance floor, or even the furnace or boiler that heats your home. *No one ever really forgets -50 Celsius. Thanks for getting this up, Krista. I’m off to look for an appropriate photo. I ❤ yours. It is not alway sunny in Summer. Summer is the accent given on this serie. LOVE that photo, Krista! So sweet, and the lighting and textures make you want to jump right in! I’m looking for summer lovin’ photos, but since it is eternally summer here…well..all my photos are summer lovin’. Can’t believe how perfect this challenge was for my post today! Oh yah! Summertime…. 🙂 Love that shot on the beach. Sweet! almost forgotten, I don’t I will ever forget that polar vortex winter we had just experience! Great topic for summer in the northern hemisphere! Here in this part of the world. It’s sunshine all the way. I’m sure we’re going to get some great entries in this week’s challenge! What a lovely shot of lovely young girls! The composition and color is stunning! 581 Responses While this challenge is closed to new entries, we encourage you to visit the Reader to find other avid bloggers. Following My Joy Summer Lovin’ – Squirrel! 2 Geeks @ 3 Knots Dunk In, The Water’s Fine! the Mom Inspired Weekly Photo Challenge: Summer Lovin’. The Harlequin Tea Set Eid-ul-Fitr 2014…Food Mubarak! Photography From North Wales Summer Lovin’–Yeah Right! Memories are made of this Weekly Photo Challenge : Summer Memories. The Wandering Poet Daily post photo challenge – Summer Lovin! Hope* the happy hugger Summer lovin’ on the other side of the world. PM27's Blog GARDENS ARE SUMMER DELIGHT! Chronicles of Illusions Summer Loving ????? Melanie Ryding – Ryding2Health BLOG Show us your Faves! Pairings :: Art + What Goes With It Bring On The Heat, Austin! thechangingpalette Those naughty ladybugs are back! KleesButterfly – A TravelBlog Summer lovin’: The deep blue sea.